This episode has some interesting ideas, but I feel like there are a few holes. That’s my snap reaction. Here are some more specific reactions. I always remember enjoying Garak as a character. I thought Andrew Robinson did a great job with the part. At no point in the episode is it addressed that biting another person is both wrong and strange. I mean, it’s one thing for Rugal to have flipped out at Garak. But biting? Right after Bashir arrives in Ops to tell everybody about the incident at the Replimat (apologizing for being late for something – a regular senior staff meeting? ), Gul Dukat is on the phone (yes, I know it’s not a phone). How did he find out so fast? Seriously, Sisko just found out? Unless Garak called, but I don’t actually think that happened. 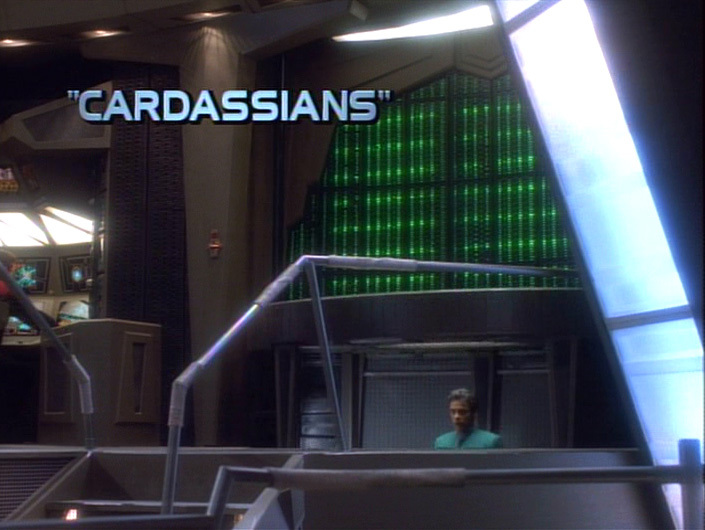 Also, the way Garak snuck into Bashir’s quarters in the middle of the night was just creepy. I know there’s a little creepy in Garak, but still. Odo alerts Sisko that Gul Dukat has just arrived on the station. The music and Sisko’s face make it seem like a surprise. Either that was played wrong and they knew he was coming and the big deal was that he had arrived or the following question must be asked. How could a Cardassian ship (likely a Galor class warship) approach Deep Space Nine without someone noticing and alerting Sisko? Four final thoughts: The episode reminds me a little of TNG’s “Suddenly Human.” Sisko’s decision, however, is the opposite, and I was a bit surprised by it. Dr. Bashir is extremely charismatic. Also, look at the funny hats behind him when he and Garak are speaking at the beginning of the episode. This entry was posted in Television and tagged Andrew Robinson, Bajor, Cardassians, D’Tan, Deela, Deep Space Nine, Fleet Admiral Brackett, Garak, Gul Dukat, Julian Bashir, Karen Hensel, Kotan Pa’Dar, Matte Paintings, Replimat, Rugal, Star Trek, Star Trek: Deep Space Nine, Suddenly Human, Terok Nor, Unification I, Unification II, Vidal Peterson. Bookmark the permalink. I like Garak, I think he is one of the most intriguing characters in the series. The banter between Garak and Bashir in the beginning seems so unrealistic. Do people really use such verbiage in conversation with each other?